In practice, it is not easy to acquire a substantial investment in your venture when assets are lacking. You desperately need funds to finance your growth plans, to expand or sometimes even to survive. How to act? The investor casino, a 1% chance to get funded. As banks become more and more strict and reduce their risk portfolio you have to find money with risk investors for example Business Angels or Venture Capitalists. On average only around 3% of the business plans that investors receive are considered of such quality that the company owners are invited to present their plans. And it gets worse. Only 1% will receive funding, and not always the amount they asked for. This is an amazingly small percentage. The question is now: are the other 99% of the plans really of such bad quality or are investors missing good ideas and opportunities here? Investors receive a ton of business plans every week. They only take a very quick look at the plans. If the business plan is presented not in line with their standards, has an incomplete business model or an insufficient financial analysis, it doesn’t meet investor criteria and it disappears in the bin. How to get better dice in this casino game? Step one is to get face-to-face with the investor. You do this by sending him or her professional written teaser or executive summary with the right content. This is the investor’s first impression of your venture. If written correctly with the right content, the investor will ask for more information and might invite you to a presentation. Reading the teaser will raise the investor’s interest and whet his appetite. Questions like: What business is it, how much do I have to put in, what do I get in return (Internal Rate of Return), what is the exit strategy and what are the risks involved? need to be answered. Step two is to give a presentation at the investor’s premises. Now the focus shifts to the details and how you present yourselves and perform as a team. Everything comes together: the team, the content and the presentation. In general, this is a 10 minutes pitch in which you give a 10-15 page powerpoint presentation. You have to be fully prepared. No mistakes or inconsistencies are allowed. Keep in mind financial people have very little time! Investors need to trust your plans. Therefore, giving the impression that you know your market and your product, and showing confidence are essential. What also helps a great deal is having paying customers. Or having a seasoned entrepreneur in the team, somebody who has done it before and knows the market. 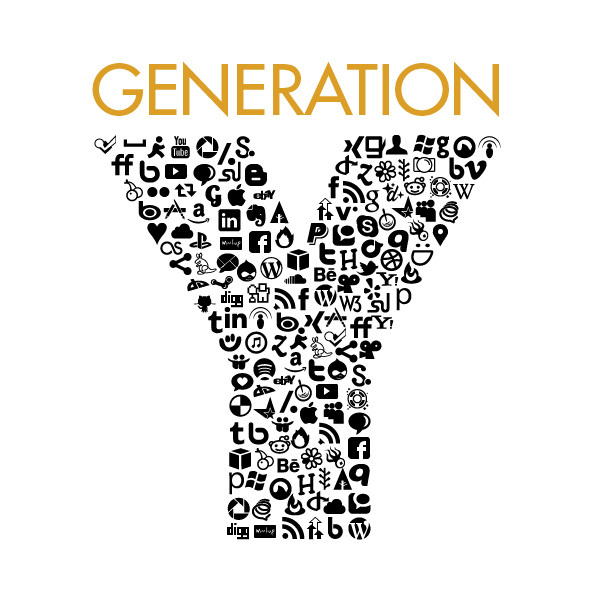 Conventional wisdom suggests that Generation Y, also known as Millenials and widely known in Holland as Generation Einstein following the book of Boschma and Groen, are among other things Media Smart: “Since they were babies, they have been confronted with the media – they understand advertising and have become the ultimate experts. They only need to see the advertisement to know what the marketing strategy of the company is”. I do not know where such ideas are founded on but my impression is that they are based more on fiction than on facts. For sure the millennials have grown in a media-dominated society but they media smartness is limited since they are heavily exposed to one medium only, namely the Internet: they watch much less TV, read almost nothing on paper (except maybe their school textbooks) including newspapers and they listen much less to the radio than their parents. This one-sided exposure can never make them experts in advertising as the above quote claims. In fact on this point I would rather argue the contrary: Their almost blind faith to everything published online as the absolute truth makes it sometimes impossible to make a distinction between reality and commercial messages. I do not have any hard evidence to support this argument, maybe some research on this would be useful. However there is some evidence already that the Millenials despite their reputation as Media Smart do in fact very superficial and limited use of even the Internet and more specifically of the Social Media: A recent study of my M&G colleagues van Velzen, Bondarouk and Klerks indicates that most of the Generation Y online users are passive information consumers. A recent study we conducted among VWO 5 and 6 children confirms this findings, pointing also to the fact that the vast majority of this segment is using the Social Media for entertainment rather than anything else. The percentage of these children who are actively creating and contribute content online is negligible. My conclusion is that often the reality can be different than the perception. Again I would argue for more research in this area and a consistent follow-up of the trends here in a longitudinal study. As about the term Generation Einstein we should use Einstein’s name more carefully! How to create significant change for sustainable business growth? You know what the market wants from you as an entrepreneur, but do you know who you are and what you want? The Business Development Program of Venture Lab targets technology based companies ranging from a start up phase up to business growth acceleration. This stresses the fact that business development is a process of ‘life-long learning. A matter of ongoing business improvement rather than a once-only action concerning organizational change. In that, life long learning as a company, in terms of organizational development, is as important as personal and team development of personnel. To stand out, an entrepreneur needs to know his strengths and weaknesses, now even more than in times of economic growth. Not only in terms of professional competencies but also in the personal qualities and skills which make him differ from his competitors. Yet what we often see when companies prosper and grow is a focus on the development of the business in terms of total quality management, reengineering, marketing development and research on business & product improvement as such. In other words, the business development plan of many entrepreneurs is geared to the market, the improvement of the product or service, and the growth of quick returns. But what happens after the marketing and sales? Where is the link with the distinguishable core qualities of the entrepreneur himself that can bring him and his business to a win-win situation? Quick growth or sustainable success? Fast growth in terms of sales does not necessarily lead to sustainable businesses or successful implementation of business concepts in the long run. For this to happen, internalizing your business strategy as an organization, along with an adjustment to the market, is required. This requires a good communication plan; internally and externally. Therefore all stakeholders need to be included. Not only in terms of informing them but also in terms of their active participation concerning the implementation of the plan and the adaptation to stakeholders’ needs and expectations. Once you know all expectations, it usually becomes very clear that different people involved looking from different perspectives to the same thing. Speak their language, Kahler (process communication model) would say! Know who you are, what you want next to what people want from you as an entrepreneur. Only then will you be able to adjust your new business concept or renewed strategy to the market, at the right time, at the right places. What does this all mean for an entrepreneur? Make clear, how you are perceived by others. Does this match with the view you have about yourself? If not, train yourself, in cooperation with a coach, to look from different perspectives and relate to your clients’ view in a way that fits you as a person. In addition, I would recommend you to discuss your actions and communication efforts with colleague entrepreneurs in an intervision setting, facilitated by an expert coach on change management and communication. Ask them for feedback. In other words; work on your personal development and communication style parallel to your professional development as an entrepreneur and business expert. This makes you stronger as a person and more visible as an entrepreneur. It will also generate more sustainable business results and a more successful business in the long run. Stay alert, be proud and allow yourself moments to look back on what you achieved in both ways; as an entrepreneur running a business and as a person getting the most out of his talents and core qualities. It is the start to transform your company into a formidable competitor. http://venturelabinternational.com/wp-content/uploads/2015/04/logo-s234.jpg 0 0 admin http://venturelabinternational.com/wp-content/uploads/2015/04/logo-s234.jpg admin2011-03-17 13:57:512017-07-18 18:59:51How to create significant change for sustainable business growth? Will Social Media marketing be outdated in just a few years? A recent survey revealed that advertising and marketing executives ranked “Social Media” as the most annoying industry buzzword. I believe that this is probably caused by a lack of understanding of how Social Media fit in the company and in its media efforts towards customers. In fact, I believe that many organisations (including those specialized in communications) have lost track of what media look like nowadays. Although there is still a lot to be learnt about Social Media and its implications for users like consumers and businesses, it seems that Social Media are starting to mature. Recent statistics indicate that 91% of all Dutch under 25 has been active on Hyves, Facebook or Twitter. More and more businesses are joining the party, but the results of their efforts vary a lot. Of course, the fact that media is changing is not new, but modern communication technologies seem to speed up the process. So maybe it’s time to zoom out a bit, take a step back and look at the communication landscape as it is nowadays. On one side there are companies trying to sell their products and services. On the other side there is the target market. In order to have communication between them we need a way of transporting messages and that is what media do. This may seem obvious, but it is striking to see how often this is overlooked. Media often isn’t looked at as a way of communicating, but purely as marketing. Owned Media. Incorporates all channels an organisation controls. Examples include the company website and Twitter account. Paid Media. Incorporates all media efforts that the organisation must pay for such as advertising. Examples include display ads and paid search. Earned Media. This is when consumers start talking about the company. As consumers start their own channel they control the media effort. Examples include viral marketing and buzz marketing. Organisations should not focus on a single media effort, but combine a well balanced mix of owned and paid media to leverage earned media. Social Media is easily mistaken to be an equivalent of earned media, but it is not. By focussing solely on Social Media as a way to get people talking about the organisation, traditional media are not getting enough priority. As a result, consumers are handed all the means to talk about the organisation, but they have nothing to talk about. 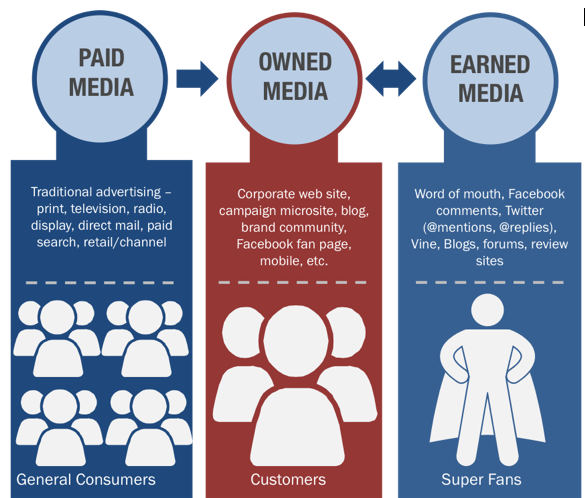 Owned media and paid media are necessary to stimulate awareness about the organisation and their current products or services. Then your customers will have something to talk about and you’ll have something to talk about with them. I believe that any form of media should not be used completely independent of other forms of media. It should always be part of a larger media strategy. In fact, media should be an integral part of a larger communication strategy. This is why we think the concept of companies that only have a specialization in Social Media or Social Media marketing will be outdated in a few years. The customers you’ll meet online through Social Media are not very different from the ones who will see your advertisements. If you want to earn their trust enough to have them talk about you, handing them just a conversation is not enough, hand them a topic too! http://venturelabinternational.com/wp-content/uploads/2015/04/logo-s234.jpg 0 0 admin http://venturelabinternational.com/wp-content/uploads/2015/04/logo-s234.jpg admin2011-02-04 08:02:472018-03-30 14:24:12Will Social Media marketing be outdated in just a few years? First published here on the Social Media Marketing blog of Dr E. Constantinides (Efthymios). Why should your business exist? Whether you develop a new business or lead an existing one, its all about the money. Or is it? As the industrialist Henry Ford reminded us a long time ago, “A business that makes nothing but money, is a poor kind of business”. I full-heartedly agree and think this remark bears even more value today than in Ford’s era. But if it is not for making money per se, why should your business exist? A careful scrutiny of the various purposes a business may have, shows us that there at least four types of purposes relevant to any business. These lead to four questions entrepreneurs may want to ask themselves occasionally. Purpose with the business: what should it do for you? The first question you may want to ask yourself, or your teammates, is what you are or were trying to achieve with the business. Did you want more freedom? Is it the realization of an ideal or an idea? Were you trying to get rid of paper work and red tape? Putting this question first place does not suggest that self-interest always comes first. What it does suggest, though, is that it may be smart to keep in mind whether your business is still doing for you what it was supposed to do and whether you’re still in the right business. If not, this is a signal to make some changes, or to leave, perhaps. Purpose for the business: what kind of business should it be? As long as it exists, your business will evolve into some kind of business no matter what. But if you don’t like to be surprised with the kind of business you end up with in a couple of years, it may help to think about this second question upfront. What kind of business should your business be? Should it be large? Innovative? Efficient? The best in its kind? Always the first? The answer to these questions is not a pure derivative of market forces or an automatic result of organizational dynamics. No, the kind of business you end up with, is largely influenced by what you want it to be. Purpose of the business: what should it do for others? It is probably this third question that Henry Ford referred to in the famous quote above. It says that your business is a poor one if it fails to be more than a money-making machine. This question concerns the intended and unintended impact your business has on others. Your business has many direct and indirect stakeholders – all of which cannot be served at the same time. Who are yours and how does your business affect them? How does your business matter and for whom? The answers to these questions can give you some insights about the added value of your business. Purpose in the business: what guides your actions? Finally, there are values and criteria that guide your everyday choices and actions. Whether implicit or explicit, all your business decisions will be guided by a normative view on what should and what should not be done – according to you. How is this for your business? How do you decide what is right and wrong? Is everything legal also appropriate? Is everything appropriate also legal? Answering this fourth question may help to make explicit how you make your choices and whether you like it that way. These are not easy questions and answering them may require substantial time and effort. Yet, asking them every now and then in a moment of reflection – in the train perhaps or when driving home – can help you to make sure that your business should indeed exist. http://venturelabinternational.com/wp-content/uploads/2015/04/logo-s234.jpg 0 0 admin http://venturelabinternational.com/wp-content/uploads/2015/04/logo-s234.jpg admin2010-11-05 17:55:432018-07-05 12:40:25Why should your business exist? Entrepreneurs create value. Or at least that is the idea. Scalability is the key to create this value. This should be done by making clever use of networks, and not by controlling everything yourself. Make use of the best skills of others, focus on your own “differentiating skills and ideas”. The triangle of value creation identifies the interaction between market/market access, product/technology and money. Having money, a product or technology alone will never be sufficient to create value. In a few cases, only having market access is enough to establish a valuable company. To have market access, networks are distribution relationships are essential. In a Kiretsu-group there is an understood role and use of networks. Scale is achieved more cleverly when the firm depends on its network, and when non-core activities are outsourced. Outsourcing makes a firm more flexible. Prerequisite for the sustainability of such a firm is multi-sourcing. This means that the firm always has at least two sources for every supply, to prevent too much dependability. When one supplier cannot deliver a promise, the firm can turn to the second supplier and does not have to say no to its customer. In practice, this gets more difficult the more high-tech a firm becomes. In any case, one of the goals remains to have few employees, those that you really need, and that you outsource all other activities into a network of relationships, preferably with as few single-dependencies as possible. Another interesting aspect of making use of networks to create value is co-opetition in the very early phases of innovation. Normally, in established markets, a company has competitors. In new and early markets, there is little or few competition. In new markets, growth and standards are more important than competition. Therefore Co-opetition (cooperating with your competitors can put priority on growth and can reduce development costs. Customers will see commonalities and choice between few competitors, and the market grows faster than when the leaders confuse the new and early markets. But of course, the customer is the best proof of your offer. Having an early customer is the best mechanism to promote your product or service. And not to forget: early customers can serve as co-developers of the offer to make it more valuable.